It takes 10 years or more to plan, permit, finance and build major new power plants. That means the decisions we make today – or don’t make – will have lasting consequences for generations to come. 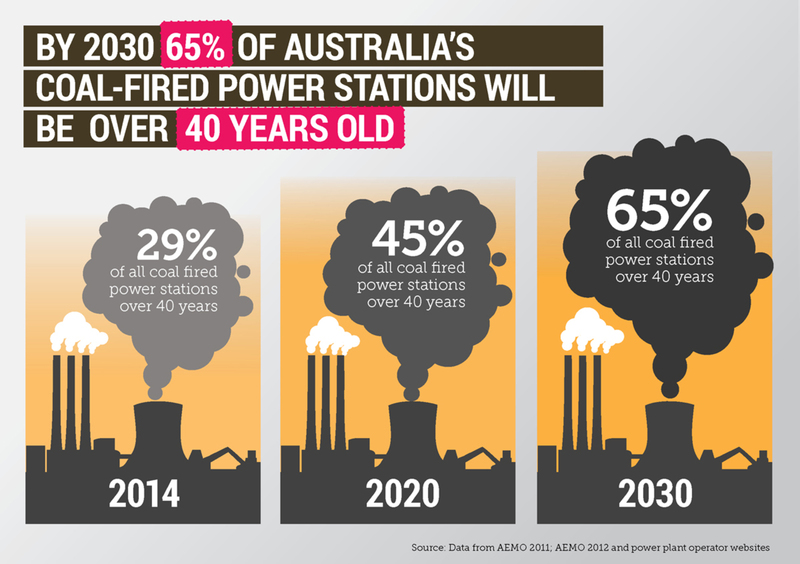 And in Australia right now, the lack of debate about needing to overhaul our ageing, high-emissions power infrastructure is going to come back to haunt us. The Intergovernmental Panel on Climate Change recently concluded that effective climate action will require a large-scale transformation of power generation globally, including “a tripling to nearly a quadrupling of the share of zero- and low-carbon energy supply from renewables, nuclear energy and fossil energy with carbon dioxide capture and storage (CCS), or bioenergy with CCS by the year 2050”. And only last month, the International Energy Agency showed how that the world’s electricity mix would need to switch from 68% fossil fuels now to at least 65% renewables by 2050 to have a chance of limiting the rise in global temperatures to no more than 2 degrees this century. Yet the latest report from the Climate Council shows that Australia’s electricity sector is ageing, inefficient and heavily coal-dependent. With the US unveiling a new Clean Power Plan to start cutting their emissions from power plants, Australians should be asking: what are we doing here? Power drives our economy, from big industry to our households. Australia today relies on coal-fired power plants for most of its electricity. The latest government figures show the electricity sector accounts for 33% of Australia’s greenhouse gas emissions — the single biggest contributor to emissions nationally. Adding to the problem is the fact that our infrastructure is ageing and inefficient, which significantly increases the emissions “intensity” of Australia’s electricity. In fact Australia’s sector is significantly more intensive than China’s or the USA’s. Within a decade, around 50% of Australia’s coal-powered generators will be over 40 years old, with some currently operating stations set to hit 60. At the moment Australia’s electricity sector is like an old car we are running into the ground, getting more and more expensive to maintain and inefficient. Yet there has been scant public discussion on the increasing age of Australia’s coal-fuelled power stations and how they could be replaced. Continuing to burn coal for power in the traditional way is incompatible with addressing climate change. While carbon capture and storage (CCS) will be essential for any new coal-power station, it is costly and difficult to combine with ageing power stations. Decommission old technology coal and gas fired plants and replace with low or zero emissions plants. Capture and sequester CO2 from coal and gas fired power plants, and associated fuel mining and production processes. Switch generation fuels from high emitting fuels such as coal to lower-emitting fuels like gas, or zero-emission fuels (such as renewables). Globally, the uptake of renewable energy is progressing rapidly and is attracting billions in investment. And renewables (hydro, wind and solar PV) are expected to account for almost 30% of global power generation by 2020. Global solar photovoltaic capacity has been growing, on average, over 40% a year since 2000 and there is substantial potential for long-term growth. And since 2000, the capacity of wind power globally has grown at an average rate of 24% per year. As more and more renewable energy is installed, costs are also dropping dramatically. The drop in cost is then accelerating the trend toward more renewable energy. Hydro is currently the largest global renewable and in Australia this source of electricity accounts for 16.1% of the country’s grid connected power station capacity. But there is little undeveloped hydro power potential remaining in Australia, and the amount of energy supplied varies as rainfall patterns change and as our weather fluctuates between El Niño drought cycles and La Niña wet cycles. Hydro also has social and environmental implications. Australia has an abundance of solar and wind resources, but it has a very low share of global renewable energy generation. But there are some Australian exceptions where renewable leadership is world-class. South Australia is undergoing an extraordinary transformation involving wind, solar and energy efficiency; Queensland is also strong in solar generation; and the ACT is on track to make 90% of its power from wind and solar by 2020. 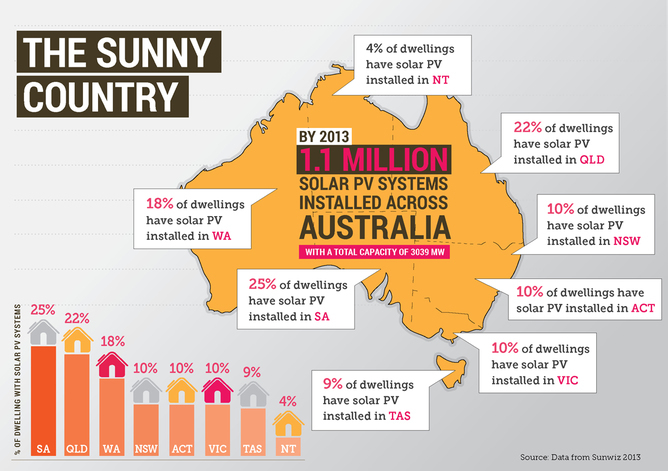 And more than a million households in Australia have spent over A$7 billion of their own money putting 3000 megawatts of solar power on their homes. However, for Australia to achieve substantial emission reductions, we need a national plan for the electricity generation sector, involving the transition to wind and solar combined with battery storage. This is the conversation that still isn’t happening in this country. We urgently need a long-term vision, strategy and implementation plan for Australia’s electricity generation sector for the decades ahead to meet the dual challenges of acting on climate change and overhauling an inefficient electricity system.